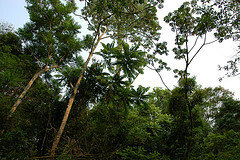 Atlantic Forest in San Rafael. San Rafael is a 6,200 ha reserve owned and protected by Guyra Paraguay, located within San Rafael National Park in the south east of the country. 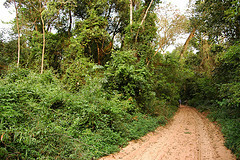 The area is identified by WWF as a hotspot for conservation and was designated an Important Bird Area (IBA) in 1997 – the first such area in Paraguay. I have just returned from spending five days at Kanguery, the field station and centre of administration for the reserve. I was there to help look for rare birds and eggs, but due to unforseen circumestances it turned into a bit of a holiday instead, which I honestly didn't mind much! The National Park is about 6 hours drive from Asunción, capital of Paraguay, and covers 60,000 ha of forest in more or less good condition (the forest to the east is generally in better shape than in the west, where the cover is much more patchy). 11 globally threatened birds and 17 near threatened species rely on the Park for their survival and 7 indigenous communities also have their home within the Park boundaries. 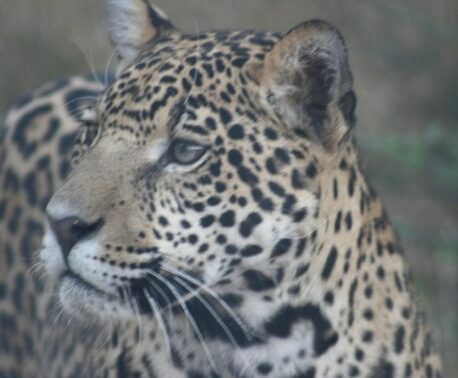 However, the Paraguayan government doesn't currently have the capacity or resources to purchase the land within the National Park, and most of it is therefore still in private ownership, making it difficult to protect. 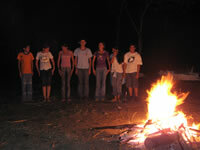 Enter Guyra Paraguay, which together with other conservation organisations is working to purchase all the central properties within the park (15,000 ha) and manage them for conservation, as well as implementing incentives for sustainable use of the land in the surrounding properties, working with local land owners, campesinos (farmers who don't own their own land) and indigenous people. Kanguery is located in one of the properties that Guyra currently own. Vast fields cover the land that was previously forest. 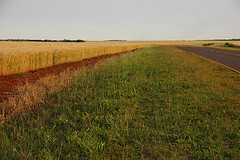 After a looong drive through endless fields of wheat, rice, eucalyptus (for paper manufacture in Chile), soya and other crops, most of which would have been originally covered by forest, we turned off the main road on to a smaller road that soon turned into an unpaved track, consisting of deep-red soil. At this point I though we were getting near the forest, but I couldn't have been more wrong! The journey continued through yet more fields, this time passing only a few villages and towns, but many small, scattered, homes of the campesinos looking after the fields on behalf of the land owners. At the beginning of the last century this was all part of the interior Atlantic Forest. However, the Paraguayan government in the 1970s decided that this was land "used for nothing" and encouraged settlers from all over the world to come and utilise this untapped resource. As a result there are now colonies from Japan, Ukrain, Germany, the US and other countries making a living from the rich soil, which – in contrast to some other forest soils – converts very well to agricultural land without loss of nutrients and erosion. The '80s and '90s saw the worst deforestation rates the country had experienced and what is left of the Atlantic Forest today is just fragments, almost entirely made up of secondary forest: The primary (virgin) forest is long since gone. The rough track leading through the forest to Kanguery. Another few hours on an increasingly bumpy track and we finally reached the National Park, and edge of Guyra's reserve. The border couldn't have been more clearly marked if they had put up a fence: A razor sharp line divided the outside area from the reserve, the line being the edge of the forest, surrounded by crop fields. The track continued through the forest for another few miles before it suddenly ended as abruptly as it had started, and we entered an open area – but this time the transition was a natural one; the forest here is too sandy and poor for trees to establish successfully and instead a vast natural grassland (the designated IBA) stretched out before us. By now it was pitch black, but we did indeed see birds, including several nightjars resting on the path requiring a beep of the horn before they reluctantly flew off. 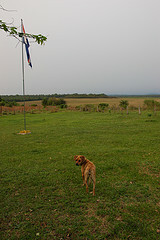 Rafaela, resident dog at Kanguery, with the grasslands and forest in the background. A few minutes later the track started climbing and when we reached the top of the hill a dog appeared from the darkness, trying very hard to get run over. We had finally reached Kanguery and were being greeted by Rafaela, one of the resident dogs.